Acromag, a globally recognized manufacturer of signal conditioning modules and related equipment, announced a new product release earlier this month. The microBlox™ line of signal conditioners provides a wide array of useful features, broad range of I/O signal compatibility, and a very compact high density footprint. Here is an excerpt from the Acromag newsletter from June 6, 2016. A full line of microBlox™ isolated signal conditioning modules are now available from Acromag. Offering over 175 models, microBlox uB modules can safely interface a wide variety of voltage, current, temperature, frequency, and other field signals with a ±5V or 0-5V DC output to host measurement & control systems. Users can select modules with fixed ranges or wireless configuration via Bluetooth® wireless technology on an Android™ or iOS® mobile device. Acromag’s free AgilityTM app for smartphones and tablets simplifies setting custom I/O ranges and optional alarm functions. The app can also display input signal values and create sharable trend charts. uB modules snap securely into compact backpanels (no screws) in any mix with 4, 8 or 16-channel capacities. With 1500Vac peak (350Vdc continuous) channel-to-channel and field-to-host isolation, the hot-swappable modules are ideal to front-end data acquisition systems or Acromag remote I/O for communication to Ethernet, Modbus, or Profibus networks. High performance is assured with up to 0.05% accuracy and 130dB noise rejection. Prices start at just $90 per module. 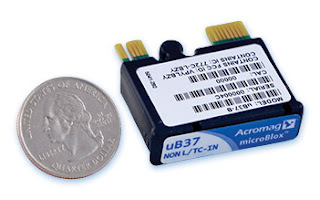 “Advanced microcontroller and wireless technologies enable microBlox modules to bring greater flexibility and signal processing capabilities into such a small, economical package.” stated Robert Greenfield, Acromag’s marketing & sales director. The microBlox module’s small size (1.11" x 1.65" x 0.4") and channel-by-channel scalability is ideal for embedded or portable applications such as test stands, defense systems, and process control applications. Well-suited for use in harsh industrial environments, the over-molded modules resist shock, dirt, and moisture with dependable operation from -40 to 85°C. Hazardous location UL/cUL Class 1 Div 2 and ATEX Zone 2 approvals are also available. Accessories include a selection of backpanels with slots to insert 4, 8, or 16 modules. Fuse clips hold the modules securely without screws for easy insertion/removal. The backpanels support surface or DIN rail mounting and include CJC for use with temperature input modules. Blue LEDs indicate modules that are ready for Bluetooth wireless technology communication. Connections are provided for a 5V power source or a 10-32Vdc supply when used with the plug-in 5V power module. A DB25 header facilitates a single cable connection to interface all uB I/O signals directly to the host data acquisition system. A consolidated catalog describing the new microBlox™ signal conditioners is included below. Share your signal conditioning and I/O challenges with a a product specialist. Combining your process knowledge with their product application expertise will produce the best solutions.